Our Mad Scientist Dave has had a longtime relationship with local high school marching bands and musical ensembles. Last winter, Dave had the opportunity to introduce taiko to the Nevada All-State Solo & Ensemble through Cara, the then band director at Palo Verde High School and a group of talented young musicians. 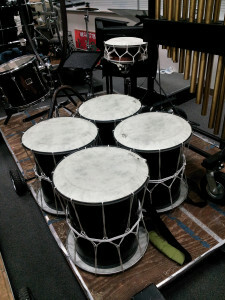 Dave put together an ensemble of makeshift rope-tensioned drums using Sonotube bodies and Remo synthetic drum heads, including two shimedaiko, six okedodaiko, and a 36″-diameter head okedo odaiko. On these drums, Dave taught a group of nine high schoolers the basics of taiko explicitly for a marching band field show. When the competition was done, Cara wanted to something more with the makeshift taiko, so Dave taught them an arrangement of Shoji Kameda’s Omiyage. The Palo Verde taiko ensemble used this song to compete in the Solo & Ensemble Competition as a Percussion Ensemble. 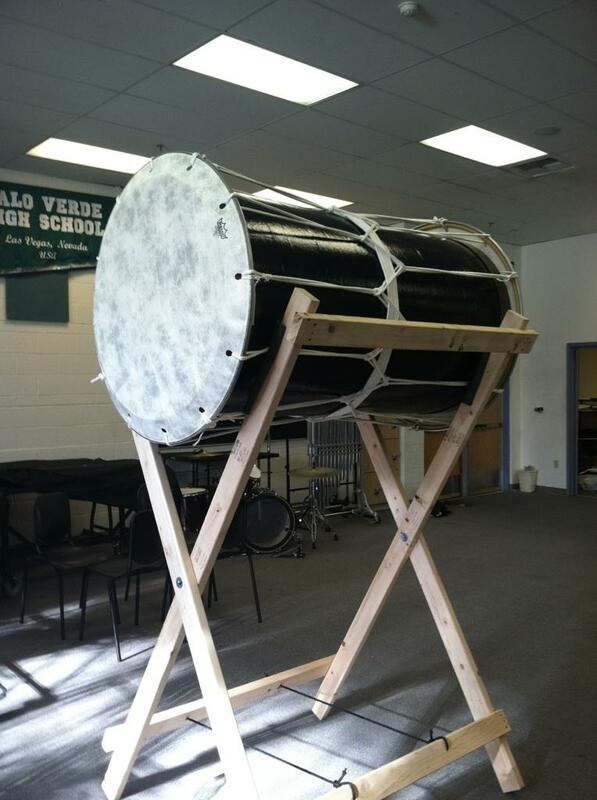 Initially, the Sonotube taiko we made for Palo Verde were just supposed to last for a few performances. During the teaching-learning process, the Palo kids started busting through the heads, so we started loaning them Korabo drums. Palo Verde taiko advanced through each round of competition all the way to Command Performance, a concert given by the winners in each category, held at UNLV’s Ham Hall. Palo sounded amazing in the venue. They blew the crowd away and received a very long standing ovation. At the end of the competitive marching band season, a few members of Korabo had the honor of performing Omiyage alongside the Palo Verde taiko ensemble at Palo Verde High School’s Spring showcase. This season, Korabo will be collaborating once again with Palo Verde High School’s taiko ensemble. Stay tuned for more details.